Plastic buckets, bowls, and tubs usually end up on the waste disposal site  at least when they start to leak or show other kinds of damage. 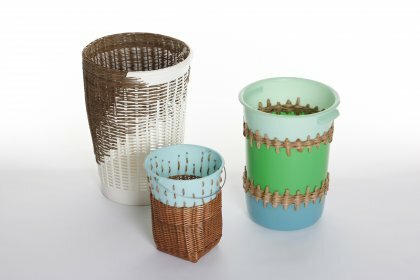 For Cordula Kehrer, however, these rudimentary remnants of plastic culture are inspiration as much as a starting point for her designs. Kehrer does not only «repair» these remnants, she puts these mass-produced and synthetic utensils in contrast to an absolutely different culture of materials and production. 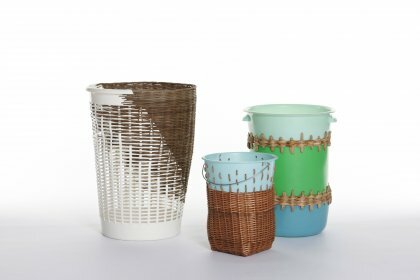 She completes the pieces she finds with wickerwork from willow, rush, or rattan. In doing so, she not only creates new aesthetics, but also avoids all forms of material dogmatism.